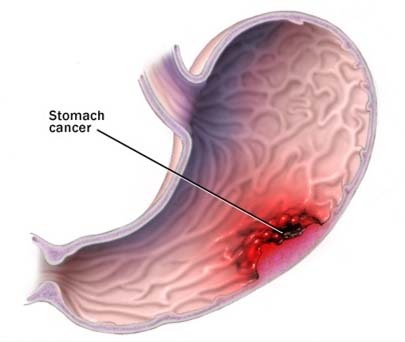 Stomach Cancer treatment and surgery India offers information on Stomach Cancer Doctor India, Stomach Cancer treatment and surgery Hospital India, Stomach Cancer treatment and surgery Abroad, Stomach Cancer causes, symptoms, Risk factors, treatment and surgery. 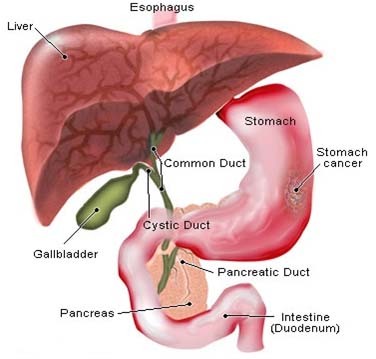 The cells that form the tumor determine the type of stomach cancer. The type of cells in your stomach cancer helps determine your treatment options. The glandular cells that line the inside of the stomach secrete a protective layer of mucus to shield the lining of the stomach from the acidic digestive juices. Adenocarcinoma accounts for more than 90 percent of all stomach cancers. The walls of the stomach contain a small number of immune system cells that can develop cancer Lymphoma in the stomach is rare. Hormone-producing cells can develop carcinoid cancer. Carcinoid cancer is rare. A gastrointestinal stromal tumor (GIST) begins in specific nervous system cells found in your stomach. GIST is a very rare form of cancer. A thin tube containing a tiny camera is passed down your throat and into your stomach. Your doctor can look for signs of cancer. If any suspicious areas are found, a piece of tissue can be collected for analysis (biopsy). Imaging tests used to look for stomach cancer include computerized tomography (CT) and a special type of X-ray sometimes called a barium swallow. The stage of your stomach cancer helps your doctor decide which treatments may be best for you. Tests may include CT, positron emission tomography (PET) and X-ray. Your doctor may recommend surgery to look for signs that your cancer has spread beyond your stomach within your abdomen. Exploratory surgery is usually done laproscopically. This means the surgeon makes several small incisions in your abdomen and inserts a special camera that transmits images to a monitor in the operating room. At this stage, the tumor is limited to the layer of tissue that lines the inside of the stomach. Cancer cells may also have spread to nearby lymph nodes. The cancer at this stage has spread deeper, growing into the muscle layer of the stomach wall. Cancer may also have spread to the lymph nodes. At this stage, the cancer may have grown through all the layers of the stomach. Or it may be a smaller cancer that has spread more extensively to the lymph nodes. This stage of cancer extends beyond the stomach, growing into nearby structures. Or it is a smaller cancer that has spread to distant areas of the body. Very small cancers limited to the inside lining of the stomach may be removed using endoscopy. The endoscope is a lighted tube with a camera that's passed down your throat into your stomach. The doctor uses special tools to remove the cancer and a margin of healthy tissue.